Your poor, poor liver. It's subjected to all kinds of abuse: the $5 shot specials, the bags of junk food you down after a night out, and the over-the-counter pain relievers you reach for the next day to deal with it all. The more you torment your liver with these vices, the more at risk you are for developing some scary stuff like scarring, fatty liver disease, or even cirrhosis. The good news about the liver is that it has the ability to regenerate... under the right circumstances. So if you've been beating up on this essential organ (most of them are!) for too long, here are some ways to undo at least some of that damage. Liver damage isn't just limited to people who drink too much; fat can build up in the liver thanks to a poor diet and sedentary lifestyle, and it should be no surprise that nonalcoholic fatty liver disease rates are surging in the Western world. Nonalcoholic fatty liver disease is tied to obesity, insulin resistance, and heart disease, and can lead to cirrhosis. The good news? It can be treated. "Patients who are morbidly obese and undergo weight-loss reduction surgery have seen cirrhosis reversed in a setting of weight loss," says Dr. Sonja Olsen, gastroenterologist and hepatologist at NYU Langone Medical Center. Obviously weight-loss surgery is a big decision that's not right for everyone. But Dr. Olsen says it doesn't take such a drastic procedure to see results. If you're embarking on what's considerably the worst offense to your liver, drinking, then taking this hippie-sounding supplement is a good plan of defense. Considered something of a magical elixir among the sommelier crowd, milk thistle is something wine pros swear helps protect the liver before heavy bouts of drinking, and there is some evidence to back it up. The National Cancer Institute claims that silymarin (the active ingredient in milk thistle) "protects against cell damage and stimulates repair of liver tissue." Silymarin can also act as an antioxidant and anti-inflammatory in liver cells, says Dr. Westin Childs. It can also help metabolize the toxic compounds from alcohol, although its real healing magic happens when you stop drinking altogether. Bummer. "It can help heal the process once the person has quit drinking, but by itself is not enough to counteract all of the effects of the alcohol," he adds. Keep in mind that these claims are mostly about alcohol's effect on the liver, not fatty liver disease. You're probably in the clear from fatty liver disease if you're not overweight, right? Not exactly. There's a growing population of people who are experiencing fatty liver even if they're at a perfectly normal weight. This is due to a dangerous combination of poor genetics and a diet rich in processed foods and sugary drinks. "We're seeing people who are not overweight who have fat deposition in the liver, probably because of, strictly because of diet," Dr. Olsen says. "They're depositing fat preferentially in their liver before they have what we call peripheral obesity, or fat deposition in their tissue." Basically, your liver gets fat before YOU get fat. If eating a poor diet can contribute to fatty liver, then eating a healthy one will give your liver a break and help heal it. Limit the amount of processed foods you're eating, and instead focus on fresh produce, lean meat, and limit your fat and simple carbohydrate (like sugar, duh) intake. And of course, a cleaned-up diet can also help people lose weight, which itself can help a fatty liver. Perhaps the biggest key to healing fatty liver is an increase in exercise. Although this should also be done in addition to all the other common-sense lifestyle changes (eating better, limiting alcohol intake, etc. ), working out has the unique property of reducing the amount of carbohydrates stored in the liver, and taking out some of the fat. "[Exercise] will not only help reverse the damage that you have, but will help remove fat from the liver, and eliminate a sort of ongoing insult to your liver," Dr. Olsen says. And you don't need to start training for a marathon or become one of those annoying gym rats either; getting your heart rate up for a sustained amount of time, several days a week, should suffice. "If you are not doing very much exercise, then even doing 20 minutes three times a week is useful," Dr. Olsen says. "Focus on exercising to the point that it would be difficult to carry on a conversation. You don't have to join a gym; you can do this on your own." You knew this was coming. Frequent alcohol consumption does the most damage to your liver. And it doesn't even have to be a 10-drinks-a-night situation; even if you only drink once a week, but binge drink (categorized as more than four drinks in one sitting), that could lead to cirrhosis. That may sound terrifying, but it shouldn't be a problem if it's not a regular habit. "The liver has a remarkable capacity to regenerate," Dr. Olsen says. "If you allow your body a break between insults to the liver, meaning not drinking all the time or limiting the amount you drink, you will recover up to a certain point." If the liver is really scarred, however, it loses the ability to regenerate. The only way to reverse damage from alcohol-induced scarring is to completely abstain from alcohol. If that plan of attack just isn't in the cards for you, it's best to not get your liver to that point in the first place. On average, she says two to three drinks a couple nights a week is a safe amount, assuming there aren't any other unhealthy liver offenders (genetics, poor diet, etc.). 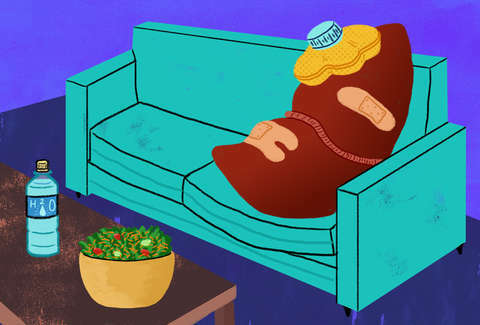 But if you feel like you've been hitting the bottle pretty heavily lately, then it's best to give your liver a break from the booze, and stick to only a couple drinks a week. While milk thistle probably only works on alcohol, there is a supplement that has been shown to treat fatty liver disease: vitamin E. A 2015 study showed it "significantly improved" liver function in patients with nonalcoholic fatty liver disease. The problem is, it also has been linked to blood clots, which is, uh, much worse. "In large studies, the use of vitamin E was shown to increase the amount of blood clots, so we definitely wouldn't say everyone should start taking vitamin E unless a doctor goes through a history and looks at your blood vessels, checks out your liver tests, and [gives it the OK]," Dr. Olsen says. So don't start downing the vitamin E just yet, but it could be worth bringing up to your doctor if NAFLD is a serious concern of yours. Although not inflicting any damage on your liver in the first place is ideal, it's hard to imagine a world without cocktails and French fries. And there is a place for those comfort food treats! Just in moderation. In general, Dr. Olsen says what's good for the heart is also good for the liver: "moderate amounts of alcohol, increase your exercise, decrease fatty foods." Unfortunately, there are no drugs available to treat liver damage, so you have to heal it the old-fashioned way: with a little TLC, and some healthy lifestyle changes. Christina Stiehl is a Health and fitness staff writer for Thrillist. She feels bad for her liver. Follow her on Twitter @ChristinaStiehl.